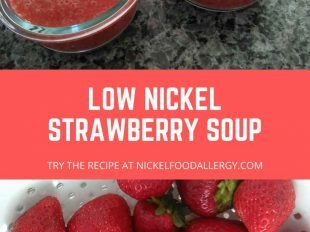 Needing a quick low-nickel recipe after work? 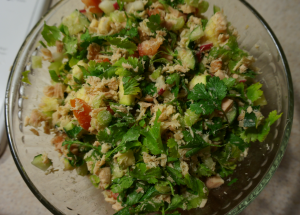 Then this high protein loaded with vegetables Tuna Panzanella Salad recipe is for you! 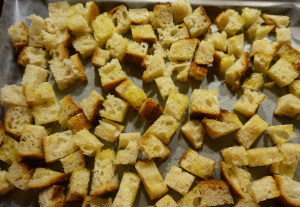 If you like croutons, this recipe includes how to make your own homemade croutons from bread, otherwise known as “panzanella.” Purchasing my bread from a bakery, I know they don’t include any soy. If you’re purchasing processed bread, I recommend you always check the ingredients to ensure no soybean oil or soy flour was used. Eating canned tuna at least once a month, I haven’t experienced any issues. Purchasing my canned tuna at Costco I buy the Kirkland branded Solid White Albacore tuna because it doesn’t include vegetable broth (which tends to include hidden soy). This quick and easy low-nickel recipe is great for either lunch or dinner. Baked homemade & nickel-free croutons or panzanella. Preheat the oven to 350 degrees. Place a sheet of parchment paper on a baking sheet. 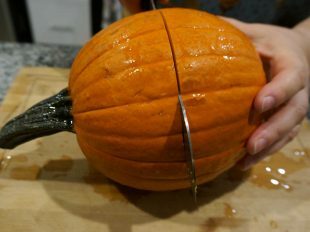 Use cooking scissors to cut your dried or stale bread into small squares in the size you like for croutons and place them in a small bowl. Pour the olive oil over the bread squares and toss them so their all adequately covered in oil. Position the cut oiled bread squares evenly on the parchment paper and bake them in the oven for 10 minutes or until fully toasted. Once the bread squares are fully toasted, place them aside and when cooled put them in a Ziploc sandwich bag so they don’t dry out. Dish yourself a serving in a smaller bowl and instead pour 1 teaspoon of olive oil and 1 teaspoon of balsamic vinegar over the individual serving and add the croutons on top. My large bowl of the low nickel vegi tuna salad before I add the croutons, olive oil and balsamic vinegar. Personally I prefer the second option, so the vegis don’t taste too vinegary should you eat the meal overtime and not all at once. 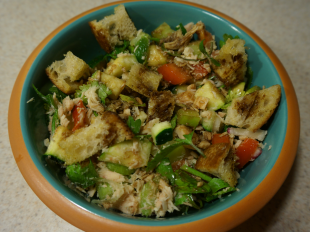 I also choose to place the homemade croutons on top of each serving of the low nickel tuna vegi panzanella salad so the croutons don’t dry out or get soggy. The abundance of nickel-free vegetables make this meal delicious! When I make the recipe there usually aren’t many leftovers, because I cannot stop eating it. I hope you try it and enjoy it too!